The week of May 5 - 12 is International Compost Awareness Week. The theme is “Compost! …Replenish the Earth for Generations." 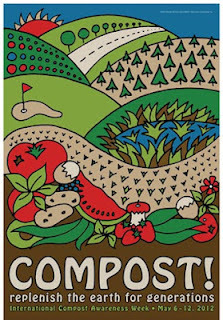 Communities throughout the world will be celebrating and acknowledging the importance of composting to the environment and to our future. Do your part by starting your own backyard composting pile or finding a compost provider in your area. Compost improves soil structure and porosity – Compost physically loosens soil and helps create a better plant root environment. Plants are only as healthy as their root systems allow them to be! Compost increases moisture infiltration and permeability; reducing bulk density in heavy soils while also improving the moisture holding capacity of light soils – Water is a precious and limited resource. Improving moisture infiltration rates, reducing erosion and runoff, reducing water loss and nutrient leaching, and improving moisture retention are all derived from compost use. Compost supplies organic matter – Organic matter serves as a reservoir of nutrients and water in the soil, aids in reducing compaction and surface crusting, and increases water infiltration into the soil. Organic matter is necessary for ongoing soil health, and serves as a fast-acting nutrient supply, while also working in a time-release manner. In effect, while plants feed off of active materials, the more stable materials are gradually converting into usable nutrients. In addition, the stable decomposing forms quickly absorb available soil nutrients for plant use. (University of Minnesota Extension). Compost allows plants to more effectively utilize nutrients, while reducing nutrient loss by leaching – Chemical fertilizers are expensive and becoming restricted in many parts of the US due to environmental concerns over Nitrogen and Phosphorus pollution. Compost allows the consumer to use less, and to make their use much more effective. Compost supplies beneficial microorganisms to soils – Compost is a living product. Healthy soil is a living material, ideally filled with beneficial microorganisms. As small as they are, soil microorganisms are the real giants in your garden, and your garden soil should be swarming with millions of these microorganisms. This “living-soil-life” helps; keep your soil healthy, decompose organic matter, replenish soil nutrients, form humus, promote root growth, increase nutrient uptake, and breakdown herbicides and pesticides. These microorganisms include bacteria, algae, fungi, and protozoa. To find out where to buy compost, go to the USCC link: Compost Locator.